Oh boy...what a year it's been. I've made so many new blogging friends, connected with teachers, parents, and librarians, interviewed some wonderful authors, and brought on a fabulous team of guest reviewers. My goals for The Well-Read Child in 2009 include giving the blog a more streamlined and unique look and feel, bringing you a wider variety of book reviews, and working to build a stronger community. More on all of these will be coming up in the New Year. Thank all of you for reading, for your comments, for your suggestions, and for your support, and I wish you a very Happy New Year! I'll be taking a break from posting and computers altogether for the next couple of weeks. Wishing everyone a happy holiday season, and I'll see you again in 2009! 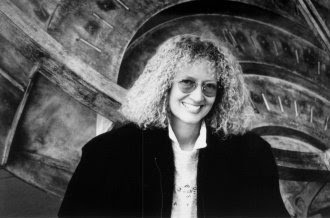 It's an honor and a pleasure to bring you an interview with Mary Pope Osborne, author of many many children's books including the Magic Tree House series. Jill Tullo (JT): Your Magic Tree House series is the ultimate celebration of imagination and adventure. As a former teacher, I've unfortunately witnessed a number of situations where kids are discouraged from using their imaginations and being creative--situations where the fun and magic of learning and discovering are taken away and replaced with rote memorization assignments. Can you talk a little about why you think it's important for children to use and develop their imaginations? Mary Pope Osborne (MPO): This subject makes my heart pound, as I think that developing an imagination might be the most important thing to develop in childhood. It leads to creative problem solving, temporary escape from difficult circumstances, and daily enrichment of life. Reading is a great source for developing imagination. And so is play: Children need to play outside-- build forts, climb trees, imagine their bikes are horses, turn a picnic table into a stage, put together a circus act, make a raft. They need to play with dolls, stuffed toys, toy army men and knights. They need to talk in funny voices and roll trains and trucks through the dirt. For thousands of years, children have invented other worlds. Now we’re letting technology do all this for them! JT: Jack and Annie have been all over the world and visited lots of different time periods. How do you come up with so many new adventures? MPO: Mainly I read. Whenever I find a subject I’m interested in, I gather lots of books on the topic and start to comb through them, and if I find myself taking notes, I’m a goner…a story is taking hold. I also get kids to vote on ideas I’m thinking about…it’s amazing how helpful this has been…the enthusiasm of readers has engineered the whole series. JT: Do you ever worry that your creative well will run dry? If so, how do you combat it? MPO: This hasn’t been a concern…yet. My main problem now is that I fractured a finger in a fall – and it wasn’t treated properly-- so I’m typing with a little bit of a handicap…But if I get caught up in what I’m writing about, I forget that problem for a while. JT: What places or time periods haven't Jack and Annie visited that you'd like them to eventually visit? JT: What are some your favorite places in the world? for kids to not only be able to read but to also LOVE reading? MPO: If you love to read, you’ll eagerly seek out books and get lost in them. And if you do this, you’ll never be bored or lonely. You can fill every empty hour with adventures, new information, and food for thought. A love for reading will ignite curiosity and connect you to the world. It will give you friends, heroes, villains. It will populate your mind with dramas that sometimes end up feeling more like your life than your real life. I can’t imagine a life without reading. I’d shrivel up and die. 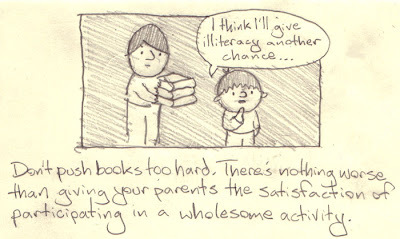 JT: Do you have any advice on how to help parents reach out to reluctant readers? Do this again and again, until hopefully, the child kicks you out of the process and starts reading silently to himself. 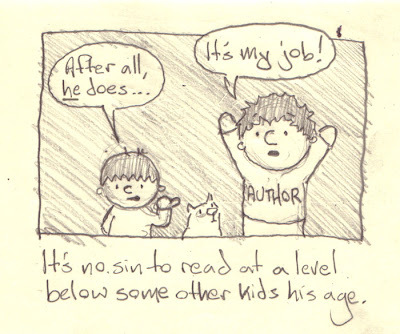 JT: What do you like BEST about being a famous children's author? 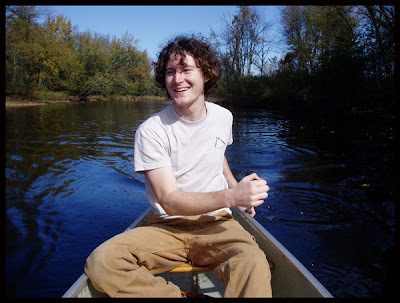 MPO: Nearly everything about it is wonderful – it satisfies my love for adventure. It gives me a good reason to read, to talk to children, to travel, to learn new things. JT:What do you like LEAST about being a famous children's author? MPO: Worrying that unknowingly I’ve slighted a child – but not writing them back, by not recognizing someone I’ve met before, by not hearing a question, or not taking enough time with them. JT: What can we expect to see next from you? MPO: Right now, my husband Will and I are producing a musical of Magic Tree House. Will and composer, Randy Courts, wrote the show based on my book Christmas in Camelot. For the next six months it will be traveling around the country on a national tour. It’s a huge show – with two-story high puppets, knights and ladies of Camelot, Irish dancing and wonderful songs. We’ll be touring a lot with the show. If readers want to know if the show’s coming to their area, they can check out the website: www.mthmusical.com. As for books, a tree house adventure with Mozart in Vienna is coming out in the spring: Moonlight on the Magic Flute. And in the summer, a tree house adventure with Louis Armstrong in New Orleans will come out: A Good Night for Ghosts. And now I’m taking notes for a story about Ireland and leprechauns. It never ends! Thank you so much for your time Mary, and best of luck with the musical. I hope to make the Baltimore show, and I can't wait to read the newest Magic Tree House books in 2009! Quick as the cat can wink its eye. She’s a young thing and cannot leave her mother. Billy Boy’s future wife may have learned to bake a cherry pie from this book, How to Make a Cherry Pie and see the USA by Marjorie Priceman. .
How to Make a Cherry Pie and See the USA is a book with lessons you would wounldn’t imagine from just reading the title. The reader gets a tour of the United States and some basic concepts about the raw materials needed for many common products, and of course, a recipe for cherry pie. Everything needed to make this cherry pie must be gathered because the cook shop is closed. You will need to get everything necessary to make what you need to bake the cherry pie. You will need a pie pan so you will need steel to make the pie pan. To make the steel you will need coal. To get the coal you will need to go to the closest coal mine. Each element of the pie making process takes you to another state to get the raw materials for a tool or an ingredient. The book reads almost like the If You Give a …books by Laura Joffe Numeroff. With the use of the word “you” as the main character the reader becomes part of the story. “In the mood for a cherry pie? Let’s get started. First, mix flour and salt in a bowl. What, no bowl? You will definitely need a bowl. Also, a pie pan, a rolling pin, a measuring cup, a pastry slab, a set of spoons, and some pot holders- which you can get at the Cook Shop. Go to New York and hail a taxi. Ask the driver to drop you off at the corner of Pennsylvania and Ohio. That is the beginning of your whirlwind adventure to gather all the necessary tools and ingredients to make a cherry pie. The author takes the reader to many states and gives a small aspect of the states culture, industry, or geography. One state the author has you visit is Alaska. There is nothing to get from Alaska. You just go because its there. I thought this was a “stretch” but a fun jaunt. Overall the visits to the states follow a logical course for the goal of making a cherry pie. The illustrations are playful and full of detail. They add to the story by depicting some of the concepts that might not be farmiliar to the children. The illustrations also depict the rich cultural diversity of our country. I would recommend this book for grades 1-3, but I plan to use it with my fourth graders who are studying the United States also. I plan to send them on a search for all the raw ingredients needed to make the cherry pie. It will be an internet scavenger hunt where they are given the object and have to find the raw materials. We will read the book as a culminating activity. 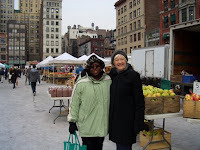 Marjorie Priceman is also the author of How to Make an Apple Pie and See the World. Many stories are written about Santa Claus so we all know what he does on Christmas, but no one really knows about Mrs. Claus. Does she just sit around and wait until Santa returns? Is she hosting a party while he’s gone? Could she be a…whale rider, sushi chef, snowmobile chopper, heli-ski-jump-mountain-top hopper? After reading this book you’ll be asking yourself, what can’t Mrs. Claus do? I really enjoyed this story. I love Christmas and try to read every Christmas picture book that I can. This one is going on my list of “must read to the students” list. I know that they will be laughing, as I was, when they read this. Not only does Kate Wharton put a comical spin on Mrs. Claus, she does it through rhyme which children will pick up on and enjoy the rhythmic quality of this story. I found myself wanting to read it again as soon as I was finished with it, and I imagine that is how a child would feel about it as well. The illustrations that Christian Slade did are just great! They add to the comedy of the entire thing. According to the story, Mrs. Claus has her own things to do while Santa is gone. My favorite part is when Santa returns. The picture shows Mrs. Claus sitting in her rocker with a cup of cocoa, like she’s been there all night, just waiting on him to return. As a teacher, I could see using this with the students to springboard some of their own writing and artwork about what Mrs. Claus does. I think that they could come up with some very creative ideas, maybe even some that Kate Wharton didn’t think of. I know it would be a hit in my classroom. I also think that young children will fall in love with this story. It’s time for us to see Christmas from a different perspective, that of Mrs. Claus. Thank you, Kate Wharton, for allowing us to do that! What would you do if your neighbors destroyed your home of nine years? Well thankfully Pale Male had many fans and friends to protest for him. Pale Male is New York City’s famous red-tailed hawk who came to Central Park when he was very young and stayed. He and a mate built a nest atop an apartment building across from the park. This was the first time people witnessed a red-tailed hawk nest on a building. Pale Male would raise more than 20 chicks in nine years in the nest on 5th Avenue. In 2004 the building owners removed the nest thanks to the Bush Administration’s weakening of environmental protections. This set off an international outcry accompanied by local New Yorkers protesting. Pale Male’s nest was soon restored. The story of Pale Male is inspiring--something wild adapts and survives in an urban environment. The writing is smooth and full of information as it unfolds. This is an easy book to share with kids. There is factual information as well as a great story with tension, drama and a perfect resolution. This should inspire new bird watchers. I know it made me get my backyard birding books out of the kitchen drawer and look up the birds at the feeders with my kids. The illustrations by Meilo So are beautiful. The reader is given a hawk’s eye view as most of the pictures are from a hawk’s perspective as he flies around the park and buildings. The water colors capture the movement of the hawks. I love the picture of the babies leaving the nest and landing nearby. The end papers are the red tails of the hawks, and even the dust jacket has a hawk in flight wrapped around the book with a stick in his beak ready to rebuild that nest. There have been several picture books about Pale Male since his nest was taken down, and this is my favorite. Pale Male: Citizen Hawk of New York City has received many starred reviews and is sure to show up on recommended book lists. 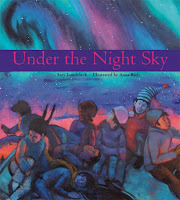 Visit Picture Book of the Day for more Nonfiction Monday delights! After spending a few days reading nothing but nonfiction for the Cybils awards, I was more than ready to get lost in a bit of fiction. Last month, I read Jen Robinson’s post about Lament, in which she called the book, "a deliciously creepy romantic novel," so this seemed like the perfect choice. Author Maggie Stiefvater saw my comment on Jen’s post and graciously sent me a copy of the book, and let me tell you, I stayed up until 3 in the morning to finish the book because I simply could not put it down. Teenager Dierdre (Dee) Monaghan is an exceptionally gifted musician as is her best friend James, and EVERY time she performs, she always throws up. In fact, she’s throwing up before a big competition when she meets Luke Dillion where else, but the bathroom. Hmmm…you might think it’s sort of creepy to meet a ridiculously handsome guy in the bathroom where you’re barfing who just happens to know your name, but Dee is drawn to Luke. In fact, they go outside where Luke gets her to calm down and actually practice before the competition. Luke himself is a killer flautist, so they decide to do a duet where they stun the audience. From that point on, weird things keep happening to Dee. She constantly finds four leaf clovers, she thinks she sees people watching her, and Luke keeps showing up all the time. Then there's this whole telekinesis ability she suddenly discovers she has. When Dee’s grandmother takes one look at Luke and tells him to stay away from her granddaughter, Dee is determined to find out what’s happening. Turns out Dee is a cloverhand, a person who can see Faeries, and Luke is a Faerie assassin. And yep, you guessed it….Dee is his target, but he hopelessly falls in love with her, and even though she knows she’s in danger, she falls in love with Luke, too. But the evil Faerie Queen, also named Dierdre, is determined to have Dee dead, which leads to a very exciting and suspenseful showdown. In this book, we have a forbidden romance, a love triangle, and homicidal faeries. What more can you ask for? A lot of people have compared this to Twilight, and I can definitely see the parallels. A girl falls in love with an older unhuman, yet gorgeous creature. Another friend loves the girl. The girl is constantly confronted with danger. But here’s where the similarities stop. Dee is a much stronger character than Bella, and unlike Bella, Dee eventually has to get herself out of the most dangerous situation yet. Maggie Stiefvater's writing is absolutely beautiful and lyrical. As you're reading, the great care she took into developing characters, adding subtle details here and there, building suspense, emotion, and passion is evident. For those of you who appreciate the beauty and craftsmanship of the written word, you'll find yourselves consuming each passage with delight. You can get a taste of her writing by reading the Prologue and Chapter 1 here. Let’s not forget the creepy factor. There were moments in the novel that gave me goose bumps. Throughout the novel, you encounter white hounds, and at one point my own white hound suddenly jumped off the bed and starting howling. Talk about goosebumps. Maggie Stiefvater has hit a home run with her first novel, and I can't wait to read Ballad, the sequel to Lament, which is coming out in the Fall of 2009. I highly recommend this book to those who like a bit of magic, a bit of romance, a bit of creepiness, and those who love good writing. It's one of my favorite reads of the year. Check out The Washington Post's Holiday Guide 2008. This section lists the best books for of 2008 for kids, pre-teens, and teens. 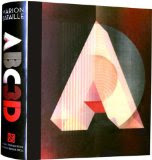 Has anyone seen ABC3D ? I've seen it at the top of a bunch of lists, and it looks like a beautiful book. I'm thinking of buying this for my daughter but am not sure if it can withstand toddler hands. Also, check out the Post's Gift Books Section. It includes a gallery of both children's and adult books they call Visual Feasts. My shopping list just got longer. On Monday, I reviewed Give a Goat, written by Jan West Schrock, the daughter of the founder of Heifer International. Give a Goat, is about a classroom in Maine who developed a school project to raise money to buy a goat for families in need. Jan agreed to do an interview, and here are her thoughts on the book, reading, and Heifer International. 1. As the daughter of the founder of Heifer International, you've probably been surrounded by inspirational stories of giving throughout your life. Why did you choose to tell the story of the children in Maine who raised money to buy a goat? What was it about that particular story that inspired you to tell it? JS: I was a teacher for many years. My favorite students were middle-school children. Often, they are very idealistic at this age. When a great teacher captures the spirit of giving and ties it with her curriculum, that’s a good story. When I discovered that Mrs. Rowell captured her fifth grade students’ imagination, to help poor children go to school, and incorporated this vision with a math unit, I knew it was magical. There are plenty of stories, and we have tons of stories in Heifer’s work, about children and other cultures, but few stories about relationships between children in the US and those in the developing countries. Give a Goat establishes that relationship. 2. Give a Goat is not just about helping others in need, but it's also about a community coming together to help raise money for people all over the world. Can you talk briefly about the power of communities? JS: A unique value of Heifer International is "Passing on the Gift," which is key not only to ending poverty but establishing sustainability for many generations. Another unique value is creating strong communities to become self-reliant. Heifer assists once-poor communities through training and gifts of livestock. Families that have learned the importance of working in community will often stay together and expand their work beyond the three years Heifer works with them. We see Heifer communities establishing micro-credit and dairy and grain cooperatives, making sure every child is educated, bringing women into leadership roles, establishing partnerships, and continuously finding ways to insure prosperity. We also see examples of mending the wounds of war as rural communities sometimes are comprised of both sides of civil wars. For example in Albania, Kosovo, Armenia, El Salvador, the Philippines, Cambodia, Rawanda,etc. Communities, with the right kind of training and future visioning, can turn poverty into prosperity, work for justice, and diminish the instinct for war. 3. Give a Goat definitely has a powerful message that I think will help make a difference in the world. When you were writing the book, what message did you hope would get across to readers? But, when children, and adults too, discover an unique way to help, a relationship is established and we as educators, parents, and students become excited about assisting with whatever resources we have. Working together, often in classrooms, civic organizations, and congregations, on a project helps us make a difference amd expand our neighborhoods. Philanthropic projects, begun at an early age, help us work together to become responsible in a world of great need. The “I-Me-Mine Generation ” can become a “We-and-Us-Together Generation.” This is the way to turn greed into compassion and usher in a new age of world citizenship. In writing Give a Goat, I wanted to lift up the joy of children working together to make a difference for other children in our world. 4. I'd like to switch gears for just a minute and talk about reading. The mission of my blog is to help parents, teachers,etc. instill the joy of reading in the children in their lives because I firmly believe that knowing how to read and also LOVING it can change lives. Are you an avid reader, and if so, what are some of your favorite books? JS: Recently I’ve been reading books focusing on agriculture and food systems: Michael Pollan’s books, The Omnivore's Dilemma: A Natural History of Four Meals and In Defense of Food: An Eater's Manifesto. Jeffrey Sachs’ The End of Poverty: Economic Possibilities for Our Time, Lester Brown’s, Plan B: Rescuing a Planet under Stress and a Civilization in Trouble, and Paul Hawken’s Blessed Unrest accounts for how collectively we must, we can, and are, changing our environment and our world. Barbara Kingsolver’s Animal, Vegetable, Miracle. Kingsolver’s book reminds me of our sustainable farm in Indiana during my childhood. Elizabeth Gilberts’ Eat, Pray, Love is inspiring as she describes her very personal year-longjourney in turning from helplessness and dependency to empowerment and caring for others. It’s a personal story very similar to the enlightenment of a Heifer community. 5. What were some of your favorite books growing up? JS: I read all of the biographies written for children I could find at the library. They were either orange or blue books, a whole row of them at the library: Florence Nightingale, Thomas Edison, George Washington, Abraham Lincoln, Elizabeth Baker Eddy, Jane Adams. I especially loved the stories of women. At Christmas time, before TV, we’d huddle around the fireplace as my father read Christmas stories. Our mother would peel apples in a blue bowl and give us slices as we, my four brothers and myself, listened. 6. As a mother yourself, can you offer any advice for helping parents reach out to reluctant readers? JS: I taught students with learning disabilities for several years. 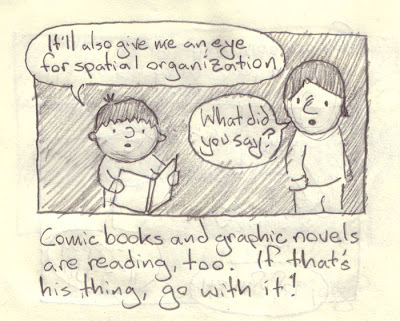 I would introduce a story suggesting the student look for things that would happen. At times, I’d read along with them, one sentence or one paragraph at a time. Sometimes we'd stop and draw a picture. I would also encourage them to tell their own experience stories and would write as they shared their story. 7. The thing I like the most about Give a Goat is that instead of just talking about the importance of giving to others in need, it actually offers real-life, doable activities. What are other ways kids can getinvolved with their communities and give? JS: Two eleven-year old girls enticed their congregation to give to a Heifer campaign from Feb. to November raising over six thousand dollars. Their parents and outreach leaders assisted them with their dream. The biggest event was an all-congregation talent show with proceeds going to their fund. Many children request gifts be given to Heifer instead of for birthday presents at their party. Many children request Heifer gifts for their consecration ceremonies, Bar mitzvah and bat mitzvahs. The librarian at the Great Salt Bay School, Damariscotta, ME, challenges the whole school to participate in a reading incentive program. Her students take then read like crazy during the harsh winter months. A big celebration ensues in the springtime. Teachers gather in community support of civic organizations, local businesses, and homes for the elderly to support a reading incentive program. The whole community becomes invested in students’ reading and students become educators about Heifer International’s work, a community endeavor. Youth in a congregation made dinners of soup, home-made bread, salad and desert for pre-subscribed take-out orders for their local community. They raised over five thousand dollars and had a grand time using the church kitchen, cooking together, and marketing. Schools in Hong Kong participate in Heifer education and raise funds for Heifer’s work inChina. High school students filmed Heifer’s work in Yunan province and shared the story with their parents and community. This past year they raised over two million dollars. 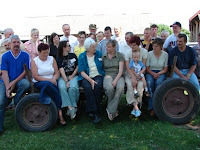 Youth in 4-H club in Poland learned the care of goats and production of cheese and yoghurt. They marketed to the villages for special events. The funds earned were donated to purchase equipment for a children’s hospital. In Armenia, a Heifer project provides training in animal husbandry in after-school youth programs. Young people learn to raise goats, primarily. They then will pass-on their gifts to youth in Heifer projects in bordering nations,Georgia and Azerbaijan, an amazing combination of skills acquired, meaningful work, and working for peace. Many classrooms and whole schools embark on Heifer education and reading incentive programs throughout the US and in several international countries raising funds for Heifer’s work. Learning about what students can do to help other children while they read is a real joy. Learning and reading is the work of children and if they can be assisted to turn their work into a reality and make a difference in our world, they become both philanthropists and motivated students! Heifer’s work in providing training and livestock, as well as the pass-on requirement, creates prosperity and instills a spirit of giving. Many youth become aware of a wider world and their role as responsible world citizens. 8. With the economy causing people to tighten their purse strings, a lot of families may not have as much money to give to charities as they have in the past. Do you have any suggestions for ways people can help out without having to give a lot of money? JS: Our project partners have said, “Thank you for the gift of a fishing pole. Our families are no longer hungry and poor. But look around the pond and see thousands of people waiting for their fishing pole. Do you also notice that the water is polluted and running out of the pond? Until you educate yourself and your children about the root causes of poverty, you are not making the big difference.” Heifer International has heard this message and has created a strong education program. We know that it is very important to educate our children about the issues of hunger, poverty, and the environment and their role in restoring a healthy world. They can learn about Heifer’s work through films, stories, and activities, which we supply. They might raise money like the children did in “Give A Goat” or in many other creative ways, and they can also share these stories with others in their school and community to help raise awareness. 9. Do you have plans to write any other books? JS: I’ve been thinking about writing a children’s book in the context of Heifer’s twelve cornerstones, our values, which are required in every proposal. Our cornerstones and our Values-Based Planning Model are the key components to successfully ending hunger and poverty and caring for the earth. Our cornerstones and our planning model insures sustainability. 10. Do you have any final thoughts? JS: I wish all children, parents, and educators would embrace Heifer’s methods of creating prosperity. Working together in community is powerful and fun. I love seeing schools create gardens as part of their curriculum. This fall, a school in Maine created a garden and greenhouse to raise produce for their school lunch program and for the education of their students and their parents! Here’s a community working together in a very exciting way. It reminds me of the Heifer way. Thanks Jan. It was an honor and pleasure! *All photos used with permission by Tilbury House Publishers. for a number of wonderful resources for further learning. Thanks to Tilbury House for allowing me to participate on the Under the Night Sky blog tour. * Images used with permission from Tilbury House Publishers. Piper Reed is in the middle at age 9. Her 5 year old sister reads better than she does, and her 12 year old sister is well, annoying by doing everything first. However, Piper has the Gypsy Club which she starts wherever her Navy family moves. This time it’s Pensacola, Florida. Piper gets the members of her newly founded Gypsy Club to have a pet show and talent contest, but what if Piper doesn’t win with her dog Bruna? There are more misadventures for the Reed sisters in Pensacola with new friends and neighbors, plus a trip to New Orleans to visit their mother’s art teacher. If you haven’t met Piper Reed think Ramona, Judy Moody, Gooney Bird Greene and Clementine. They would be perfect for Piper’s Gypsy Club although they would all want to run it. 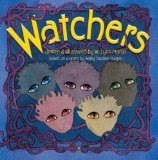 This is a wonderful series for younger readers, well written and lively. The real issues of moving and missing family members in the military are addressed but the stories are balanced and fun. The illustrations capture key moments in the story and make you laugh. This series would also be good as a read aloud. Piper Reed: Navy Brat has enjoyed starred reviews from School Library Journal, Horn Book, Publishers Weekly and others. Piper Reed will be around for a long time. She’ll give Ramona a run for her money so to speak. Pair with Piper Reed: Navy Brat for a great reading adventure! Thank you Callista at SMS Book Reviews for writing this review! This story is based on a poem by Kelley 'Duckee' Magee. It's the story of a little boy who is being watched while he sleeps. He can see figures moving but he's not sure what they are. He thinks they must be monsters and he vows to catch them one night. He sets up a trap and waits and sure enough he catches something. What he caught isn't what he was expecting at all. They aren't monsters but fairies and they are there to help him, to watch over him while he sleeps. This is a cute little story for believers in fairies. "At night they surround me when I sleep. So I plan to catch them where they creep. But tonight I'll stay awake at last." The illustrations are sweet, with lots of purples and dark blues and bright eyes for the fairies. The shadows of unknown creatures on the wall are shown very well and it reminded me of when I was a child and saw scary shapes in the shadows. My only reservation with the book is the depictions of what the boy thinks the "monster" might look like. I'm afraid that this talk of monsters would frighten a child. If your child hasn't experience the "monsters under the bed" phase, then don't read this book or it might plant the idea in his or her head. If your child is already in that phase, then this would be a good book to alleviate those fears. I'm excited to introduce Callista, our newest contributor at The Well-Read Child! I'm a 20-something mom of 2 girls who loves to read. I started reading to my children right after they were born and we read everyday, many times a day. I believe it is because of this that my eldest daughter is listening to books above her age group. I understand the importance of reading to children and children reading to themselves too and I hope to help inspire others to read more with their children. I love to read children's and teens books, especially non-fiction as well as adult non-fiction. I spend most of my time reading and blogging at SMS Book Reviews. That Maxwell Eaton III is at it again! 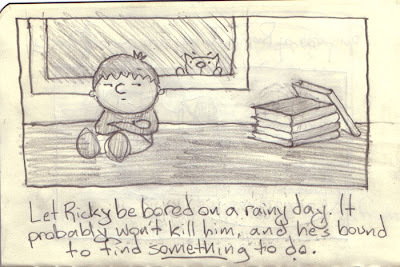 Check out his interview and series of cartoons at Mommy Mandy's. Mommy Mandy asked him, "My daughter is almost 6 and in Kindergarten. Can you please write about making friends, showing respect to each other and how you incorporate these themes in your books?" Maxwell had a great response along with a few cartoons about making friends. 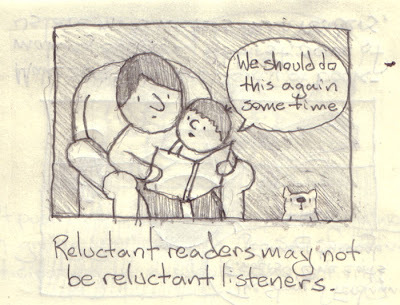 Oh, and thanks to Jules at 7-Imp for reposting the "Ricky the Reluctant Reader" cartoons and for helping spread the word about reaching out to reluctant readers! Growing up, Judy Blume was one my favorite authors. 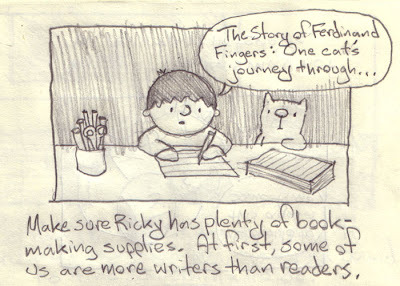 I read and re-read Superfudge and Tales of a Fourth Grade Nothing until the pages fell out. And don't get me started on Forever . . ..
Now Judy has a new series of books out featuring "The Pain and the Great One" for a new generation of readers, and I was thrilled and super excited when I was asked to be a part of her blog tour. Here are my questions and Judy's responses! 1) The characters in your books seem so authentic, and the issues and feelings they experience are just as relevant today as they were 20 years ago. How do you so effectively capture the point of view of children and young adults? JB: I wish I knew. I connect with kids, I identify with them – always have. 2) As an author whose books have been challenged and as someone who opposes censorship, what advice can you give parents and children who want to speak out against censorship? National Coalition Against Censorship put this tool kit together for my website. You’ll find out everything you need to know about fighting censorship there. But the first step is to get involved. Read the book that’s been challenged. Censors usually take words and phrases out of context. Remember, it’s never about just one book. If you say, “Well, I don’t care if they ban that book,” the next time it could be one of your favorites. Where does it stop? Where do you draw the line? The book that may be wrong for your child or your family may be the very book that’s perfect for another child or another family. That’s why it’s important to have a wide variety of books from which to choose. Intellectual freedom is one of our rights. It’s up to all of us to protect it. 3) What do you like the most about "The Pain and The Great One" series? Do you think your readers like the same things? JB: I hope so! I like the humor. I love the illustrations by James Stevenson. I like the give and take between Jake and Abigail. I like their sensible parents. I like Mary, Jake’s first grade teacher who is based on my best friend from childhood who is also named Mary and who teaches first grade. And then there’s Fluzzy, the cat. Don’t get me started on Fluzzy! 4) The characters The Pain and The Great One are based on your son and daughter. Is Fluzzy the Cat's character based on a pet or person in your life? JB: Let’s say that originally the characters were inspired by my daughter and son. By now Jake and Abigail have taken on their own lives, though I still get ideas from my grown children, as well as from my grandson. About Fluzzy…hmmm… We had a cat when my children were young, then another when they were teens. Now my daughter has the cat. He visits me every weekend during the summer. So I’ve been observing cats up close and personal for a long time. There’s a bit of each one in Fluzzy. 5) What question do you wish someone would ask, and what is your answer? JB: I’m not going there! Thank you so much Judy for taking the time to answer my questions. It was truly an honor. 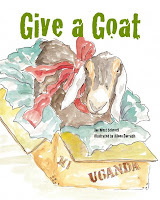 Give a Goat is the true story of a classroom in Maine who were inspired to help others in need after reading Beatrice's Goat, a story about a Ugandan girl whose family received a goat from Heifer International. The children decide to raise money to give their own goat through a class project and inspire others in the school and community to do the same. 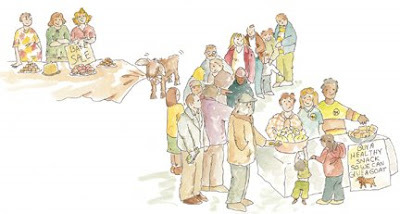 Written by Jan West Schrock, the daughter of the founder of Heifer International, Give a Goat is not only a story about giving, but it's a story of how a community can come together to help others who are in much need of it. I admittedly didn't know what to expect when I heard the premise of the book. I was a bit worried that it would be a heavy sell for Heifer International, and even though I think they do wonderful things, I dislike marketing efforts disguised as children's books. I also am not a fan of books with didactic or overpowering messages. So, don't get me wrong, it IS a story about how kids raised money to donate to Heifer International and the organization is mentioned by name in the book. 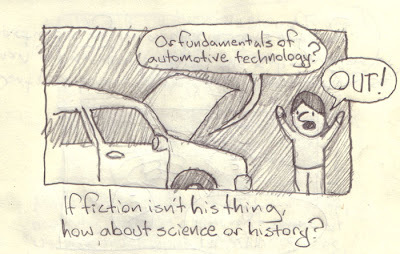 After all, it is nonfiction. And the book does have a message: give to others in need. However, I think Jan Schrock did a good job of telling the story and not getting too heavy handed with mentions of Heifer International. What I liked about it is that it gives ideas for what kids, schools, and communities can do to raise money for ANY organization or individual. I do think that many kids and adults want to help out but either don't have enough money to make an individual donation or don't really know what to do. So, I think many will appreciate Give a Goat for that reason. I would recommend this book to families and classrooms who want ideas for how to raise money for charity. Told through a heartwarming story and inspirational story, I think it may motivate kids to help out. Come back on Saturday for an interview with Jan Schrock. Happy Saturday! 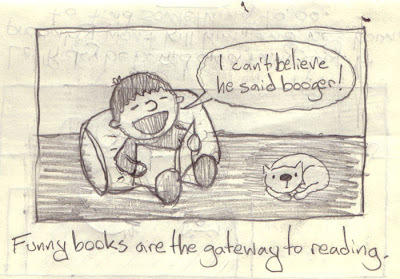 This morning I noticed that I haven't updated the little slideshow of kids reading in quite a while. If you have a picture of your child reading or of you reading with your child and would like to include it in the slideshow that's in the top left corner of The Well-Read Child, please email it to me at thewellreadchild AT gmail DOT com. It would be great to get some pics of kids reading from age baby to teen. If you also have a picture of yourself reading when you were a child, that would be awesome, too! Please note that I will never include the name of your child in the slideshow and will rename your image if it does include your child's name. 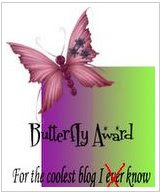 Jen Robinson at Jen Robinson's Book Page seriously made my week when she awarded me and some other fantastic blogs with a Butterfly Award for "the coolest blog I know." Thanks Jen! I subscribe to about 200 blogs, so my reader is always full of great content. And while there are many many blogs I love and that I think are cool, here are some cool blogs that immediately come to mind. 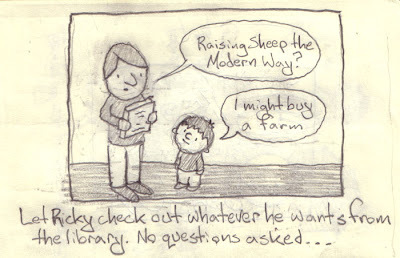 Abby (the) Librarian: I love Abby's reviews and her "Day in the Life of a Children's Librarian" features. I'm also enjoying her current "Twelve Days of Giving" feature where she's recommending all kinds of books to give as gifts. Book Dads: Fathers that Read! : I recently discovered Book Dads and immediately loved the description: "A site for fathers, or anyone who wants to read with their children and are looking for books with positive representations of fatherhood. " It's a great resource with book recommendations for a variety of reading levels. Eva's Book Addiction: Eva is a children's librarian, and I absolutely love her well thought out reviews. I also know that when I read one of her reviews, I'm bound to love the book. For example, her reviews of Savvy, and Greetings from Nowhere inspired me to add the books to the top of my reading list, and I was not disappointed. Even though she's only been blogging a few months, her blog has quickly moved to the top of my list of resources to turn to for good book recommendations. Maw Books Blog: I've been following Natasha's blog for quite a while. She features book reviews for children, teens, and adults, and she also sponsors a lot of fun giveaways. But perhaps my favorite features of Maw Books blog are Natasha's author interviews. She often asks author to share their favorite recipes, many of which are mentioned in their books. Natasha even sets about making some of the recipes. For instance, today's post details her making author Cynthia Lord's Whoopie Pie recipe. They look insanely delicious! Breeni Books: Sabrina's blog was one of the first book blogs I discovered when I started blogging in 2007. She reviews a wide variety of books for children, teens, and adults and also has a number of guest reviewers contributing. I also like how she features a lot of books that I would have otherwise never heard of had I not come to her blog. Sabrina always writes well thought out reviews, and I know that I can always get an honest assessment of a book at her blog. Meggie. Mo. Resa. Farid. Fenoglio. Elinor. Darius. Orpheus. Black Prince. Adderhead. Mortola. Violante. Mmm. Dustfinger. The bestselling Inkheart trilogy continues, and ends, with Inkdeath. From the get-go I must tell you… there’s no picking up this “stunning conclusion” without first reading Inkheart—and then Inkspell! Each fantasy builds upon the prior weaving an unforgettable tale of magical adventure. Inkdeath, like its predecessors, is filled with a love of literature. Every chapter begins with a quote. From contemporary to classic. From Mark Twain to Ranier Maria Rilke. Story-loving characters, a reverence for the written word, and book inspired transformation make it clear: books are to be treasured; books bring joy. Books can change us. Books can change the world. Meggie’s father Mo is a bookbinder. When he reads aloud, characters break free from the page leaving their world to enter ours. And there is always a trade. In the first volume, Mo reads from his favorite book, Inkheart, and several sinister characters appear in his living room. Just as unbelievably, Meggie’s mother, Resa, disappears—into the book. I don’t know when I’ve been so restless waiting for a book. Captivated by Inkheart and Inkspell, I was desperate to read Inkdeath. And I do mean desperate! Did the finale to this three-book fantasy adventure fulfill the longings of my anticipatory heart? To be honest, backstory slows the beginning, Meggie’s character takes a backseat, and this book seems darker, less edge-of-your-seat than the first two. Like the others there are a few words I would rather kids weren’t exposed to. But… I still give a hearty recommendation for this marvelous conclusion. Why? I love Funke’s poetic style, dazzling imagery, and timeless themes. And, of course, the book-loving undertone. Inspired, thought provoking prose leads readers to wrestle with desire and passion. And good versus evil. Vivid characters beg to be loved, hated, or in some cases, a bit of both. An overarching message pervades: actions rather than words ultimately determine destiny. The words of others can not conquer our power to choose. Yes, I do love this book! The book’s breathtaking climax includes a twist. A wide-open door for more of Funke’s Inkworld. A different world perhaps, with different characters. But hope, however faint, exists for a continuation of her timeless classic. Billed for 9 to 12 year olds (I’d lean to the higher end) Inkdeath is a fantastic read. And I’m not talking fantastic for kids. This book is fantastic—period. Highly recommended. Today, I am super excited to present to you a guest post from author Maxwell Eaton of The Adventures of Max and Pinky fame. Maxwell's Max and Pinky books are delightful gems full of humor that I think make them the perfect books to attract reluctant readers. So, I asked Max if he'd be willing to write a guest post about reaching out to reluctant readers. Well, can I just say that when I received his responses, I was thrilled at the creativity, effort, and humor that Maxwell put into the post. Check it out! 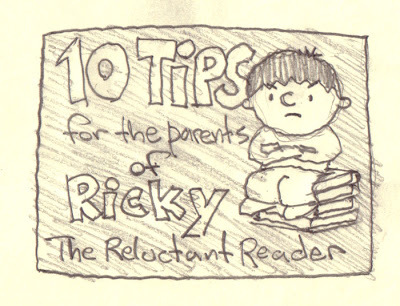 In discussing reluctant readers I’ve decided to be a “wreluctant writer” and quickly sketch out a few tips for any parents out there with their own little Ricky at home. Of course, I’m not a child behavior or literacy expert, but I do remember what it was like to be at the age where getting me to read was like taking me to get a haircut (a long, drawn out, hopeless battle where fifteen bucks goes down the drain and somebody’s ear gets cut). Oh to be twenty-three again. Anyway, I hope these little suggestions help or, at the very least, don’t result in any lawsuits. Then I’d have to reluctantly read the fine print on the subpoena, and that isn’t fun at any age. Enjoy! Thank you so much Maxwell for all of the fabulous tips and for taking the time to present them in such a unique and fun way! You're a rock star! 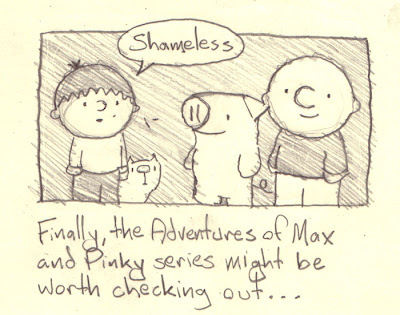 And seriously, everybody, if you haven't checked out The Adventures of Max and Pinky, I don't know what you're waiting for. Click on the links below for more information about each book.